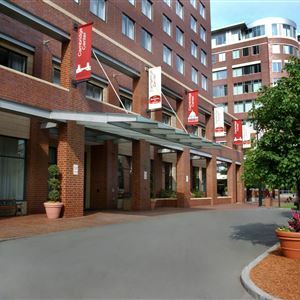 Property Location With a stay at Residence Inn by Marriott Boston Cambridge in Cambridge, you'll be in the business district and convenient to Massachusetts Institute of Technology and Hynes Convention Center. 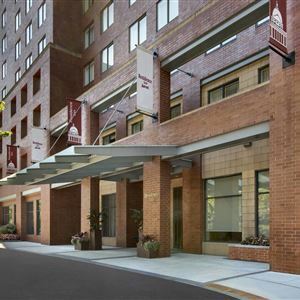 This aparthotel is close to Boston Public Garden and Copley Place. Rooms Make yourself at home in one of the 221 air-conditioned rooms featuring kitchens with full-sized refrigerators/freezers and ovens. Smart televisions with cable programming provide entertainment, while complimentary wireless Internet access keeps you connected. Conveniences include phones, as well as desks and separate sitting areas. Amenities Take advantage of recreation opportunities such as a fitness center, or other amenities including complimentary wireless Internet access and gift shops/newsstands. This aparthotel also features a fireplace in the lobby, a picnic area, and barbecue grills. Dining Grab a bite from a snack bar/deli serving guests of Residence Inn by Marriott Boston Cambridge. Meet other guests and eat at a complimentary reception. Business, Other Amenities Featured amenities include complimentary wired Internet access, a business center, and express check-out. Planning an event in Cambridge? This aparthotel has facilities measuring 2100 square feet (195 square meters), including meeting rooms. Self parking (subject to charges) is available onsite. With a stay at Residence Inn by Marriott Boston Cambridge in Cambridge, you'll be in the business district and convenient to Massachusetts Institute of Technology and Hynes Convention Center. This aparthotel is close to Boston Public Garden and Copley Place. Make yourself at home in one of the 221 air-conditioned rooms featuring kitchens with full-sized refrigerators/freezers and ovens. Smart televisions with cable programming provide entertainment, while complimentary wireless Internet access keeps you connected. Conveniences include phones, as well as desks and separate sitting areas. Grab a bite from a snack bar/deli serving guests of Residence Inn by Marriott Boston Cambridge. Meet other guests and eat at a complimentary reception. Featured amenities include complimentary wired Internet access, a business center, and express check-out. Planning an event in Cambridge? This aparthotel has facilities measuring 2100 square feet (195 square meters), including meeting rooms. Self parking (subject to charges) is available onsite.